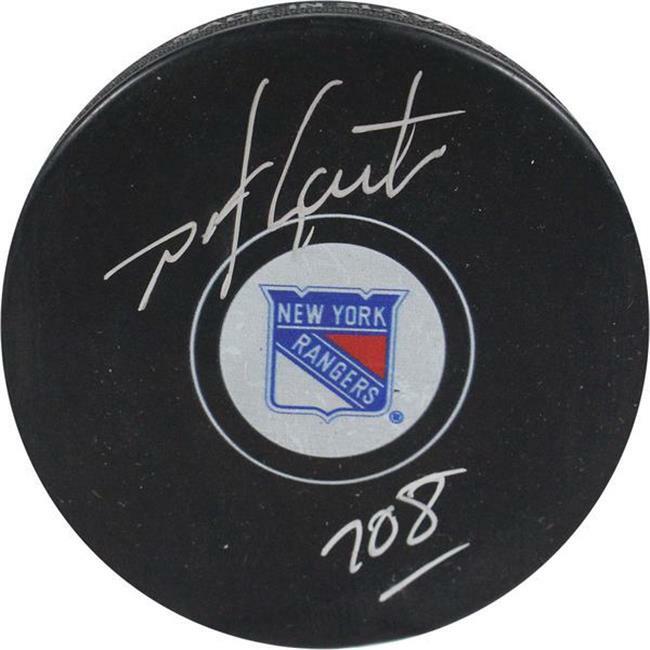 This puck is hand-signed by Rangers legend Mike Gartner with the inscription ''708. '' Known for his blazing fast ability to beat defenders down the ice, Garter in his 19 year career in the NHL played for several teams such as the Washington Capitals, Minnesota North Stars, New York Rangers, Toronto Maple Leafs and Phoenix Coyotes. Garter became the first Ranger to score at least 40 goals in three consecutive seasons and he also became the fifth player in NHL history to reach 700 goals. In 2001 Mike Garter was inducted into the Hockey Hall of Fame.